Captured Soviet soldier dressed in SN-42 body armor. Karelia, 1944. 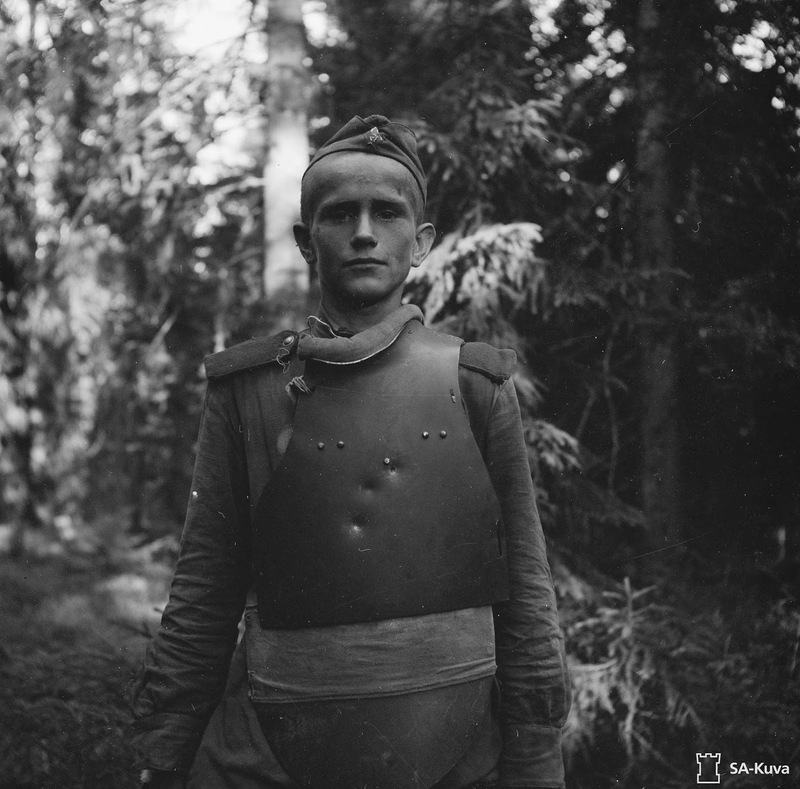 Portrait of a young Soviet prisoner of war in a steel breastplate SN-42, made of 2mm steel (.08″) and weighing 3.5 kg (7.7 lbs), captured by Finnish troops during the Finnish-Soviet Continuation War. A testament to the breastplate’s effectiveness, the young soldier had been shot three times in the chest and left unharmed. Image taken near Syskyjärvi, Karelia, Finland (now, Syuskyuyarvi, Republic of Karelia, Russia), July 15, 1944. SN-42 (Russian: Stalnoi Nagrudnik – Steel bib) is a type of body armor developed by the Red Army in World War II. The native Cyrillic abbreviation for the vest was “СН”. It consisted of two pressed steel plates that protected the front torso and groin. Bib SN-42 was designed to protect against bayonet attacks, small fragments of shrapnel, and 9mm pistol bullets with lead cores, providing protection against fire from a MP-38/40 submachine gun from distances of 100–150m, and a single shot from a 7.92×57mm Mauser rifle (like the Gewehr 41), but on the condition that the bullet went on a tangent. Following the adoption of the Wehrmacht on the supply of 9mm cartridges, the cartridge code R.08 mE (German: mit Eisen Kern), with a bullet with mild steel (iron) core, required the thickness to be increased to 2.6 mm for the chest plate (2.5 – 2.7 mm). This redesign received the name SN-46. Estimates of the plates’ performance from front-line soldiers were mixed, receiving both positive and negative feedback. Unit commanders and soldiers said that the breastplate worked well in street fighting and other type of close quarter combat, and in addition to the steel helmet, was a good and reliable method of protection from bayonets, bullets, and shrapnel. It is also necessary to point out the morale value of the breastplate. Soldiers equipped with the breastplates that had experienced their reliability went into battle calmly and assuredly. However, in the field where assault teams often had to crawl the breastplates were just an unnecessary burden. (Photo credit: Esko Töyri / SA-Kuva).